In a caring relationship, there is no room for punishment. When you punish children, they rarely feel sorry about what they have done. Instead, their minds become preoccupied with revenge fantasies and deprive them of the chance to face their own misbehaviour. Following the above alternatives to punishment will teach your child responsibility foster a good relationship between the two of you. Point out a way to be helpful. Express strong disapproval without attacking character. What emotion are you feeling? Are you angry, upset, disappointed, etc.? Let your child know the exact emotion you are feeling, and keep in mind: do not blame or attack your child. 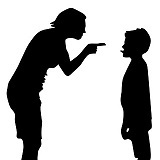 When your child misbehaves, clearly communicate to them what you expect of them. For example, if they borrowed something of yours and left it out in the rain, let them know that you expect them to take care of any item they borrow from you. Show the child how to make amends. Teach your child how to make up for their mistake. What can they do that will solve the problem? Give your child two options to choose from, both of which will achieve your end goal. Your child will feel as if they are in control and be more likely to comply. For example, if you are at the store and your child starts to misbehave, give them two choices: they can either walk by your side or sit in the cart. Take action (remove or restrain). This step should be taken only if other steps do not work. Either physically remove your child from the area in which they are misbehaving, or restrain them until they calm down. Allow the child to experience the consequences of their misbehavior. If your child continues to misbehave, let them experience the consequences of their misbehavior. For example, if they misbehaved in the store and as a result, you had to leave early, do not allow them to come with you the next time you go to the store.